I do not wish to offend for the sake of offending with this post, but I do wish to share an opinion. I speak this with humility and with the firsthand witnessing of several people I have known who have died from horrible things. I don’t know how else to say it so I’ll just drop it on you. Suffering does not mean you are a good Christian. Suffering for suffering’s sake, having to put up with bummer reality on a fallen planet, stinks but does not equate to spiritual suffering or suffering for righteousness sake. Many believers have been built up through their struggles and many have been brought to salvation through it. But being in it does not give you any special pull with God or make you mature just because your life currently stinks. It’s like the people who died in the Twin Towers on 9-11. They called them heroes because they died when a plane ran into them. That’s not a hero; that’s being in the wrong place at the wrong time. The firemen who rushed into the burning building, now that’s heroism. Dying does not equal heroism, nor does suffering equal salvation. I mean no disrespect, but I believe there are many people who think they are on God’s side because they are grinning through diseases while Satan is having a field day with their delusions. Salvation is on the basis of faith, not on the basis of grinning and bearing life. Protected: No Password? Then Not For You! Mike Piazza used to be one of the greatest catchers in Major League Baseball. I never liked him because he played for teams I hated and always looked girly to me, but that’s just me and I’m weird. Apparently Piazza is a man of faith, something I was not aware of. However, he’s also a man of girly faith, which seems to fit the impression I have of him perfectly. Allow him to explain in an interview from Sports Illustrated. Q: Do you have a favorite prayer? A: I love the rosary, and I say the Hail Mary a lot. The devotion, especially my devotion to the Holy Mother, is something that’s helped me a lot. And I love praying the rosary, so I say my Hail Marys all the time. Q: Could you say a little more about what Mary means to you? A: The fact that she was just so devoted and so special, that God chose her to bear his son. It’s, like, wow. It’s really a special thing. I love reading about her, and reading about some of the apparitions, or reported apparitions, throughout history. I wish I had so much grace that I would be privileged to see it. I wish I had so much grace that I would refrain from making my next comment, and alas, I do! Praise God. The autobiography of Brian “Head” Welch, former lead guitarist for heavy metal band Korn, has hit the top 20 of the NY Times Bestseller list. The book shows Head’s life in Korn and drop into depression and misery only to be rescued by God. His conversion must be real, he used the word “just” twice in one sentence and even in a good Christian context. Welcome home Brian! Update: The church bothered by a bidet billboard near them featuring naked buttocks has made their point and the company has agreed to sanitize their ad. I came across this page with motivational posters for people who belong to the emerging church movement. Pretty good stuff. 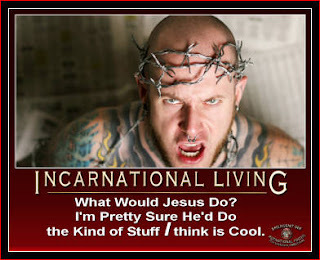 They use this to justify their no-obligation gospel and their seeker sensitive entertainment. “Be all things to all people” is always used to say that the church has to be MTV to attract sinners. I would offer that this might be taking the verse slightly out of context. First, Paul is talking about himself, He uses the pronoun “I” showing that he is not referring to the church. He tells the church what to do: be the edifier of believers. Individual believers, such as Paul and you and I, have the liberty to bend in order to help sinners find Christ. Second, even on an individual level this verse is generally brought up to justify Bob’s propensity to drink beer, smoke weed, swear, watch wrestling, attend Eminem concerts and so forth. You know, not cuz Bob likes it, oh no, but because Bob is reaching out to unbelievers. Riiiight. But even if that poor, sloppy reasoning is what Paul is referring to, why do we never see this verse applied equally, all around? I have never seen it used to stop Christians from protesting abortion, homosexuality, evolution, etc. Be careful next time you use this verse because it pretty much means you won’t be offended by anything. Only a very mature believer, such as Paul who said, “I judge not myself,” should be able to bandy it about. Until then, we’ll rejoice in our liberty until we all reach perfection in Christ.